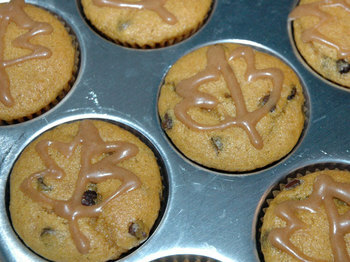 A couple of days ago I made a batch of Maple Cupcakes, p. 67 in Vegan Cupcakes Take Over the World. My plan, while baking my way through the book, is to follow the recipes as written (I am an improvisational & revisionist cook, so this goes against my nature a little bit), but I was partway through mixing this recipe before I realized that I did not have: maple extract, enough maple syrup to make both cupcake & recommended frosting, or walnuts. (Even if I had walnuts I probably wouldn't have used them, though, since I am not a big fan, thus no walnuts in the first place.) I used 3/4 tsp. 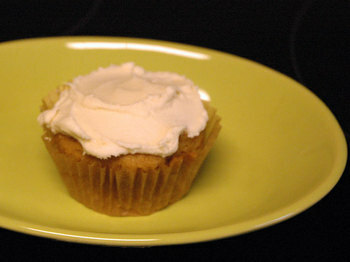 each of vanilla & almond extracts instead, made a maple Vegan Cream Cheese Frosting (p. 158 -- with 2T. maple syrup added), & left out the nuts altogether. Oh, I also followed their suggestion to use half whole wheat pastry flour, but I've been doing that in all the recipes anyway. 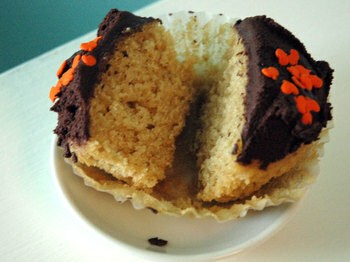 I ended up one cupcake short, probably because I left out the nuts. 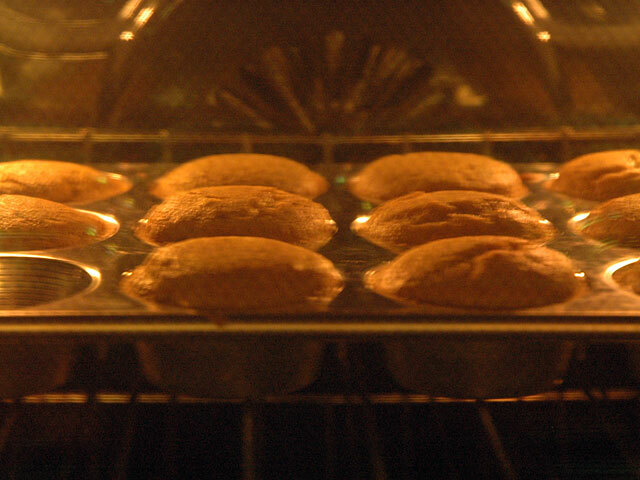 This was the first batch of cupcakes in my new oven, & I'm not sure if it's a particularly excellent recipe (it's certainly tasty, but doesn't seem much different on the nuts & bolts level than the first three recipes), if the maple syrup makes a big difference to the texture, or if it's the oven, but (despite the slight over-cooking -- see the muffiny tops on a few?) 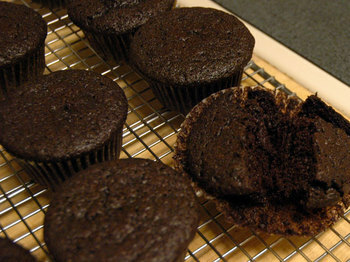 they were perfect, with possibly the best crumb of any vegan cupcake I've ever made. I want to go back & make another batch of a recipe I've already tried to see if the oven really does make that much of a difference, because it's kind of an amazing change. Here's the glamour shot, which is actually both more & less glamorous than I'd intended: on the one hand, the new black cooktop certainly looks dramatic, but on the other hand, there was a much prettier cupcake in the tray that I meant to use for my model, but someone (possibly me) ate it. I'm finding that I'm using only about half a recipe of frosting for each batch of cupcakes, & although I keep meaning to do some fancy decorating with swirly mounds of frosting, the frostings I've tried from the book so far are sweet enough that I'm not sure a swirly mound wouldn't be way too much. That said, adding maple syrup to the cream cheese frosting recipe worked really well & I thought the "cream cheese" brought a nice mellow flavor to the cupcake party (I use Tofutti brand, if you get the yellow container it's made without hydrogenated oil). I definitely want to try these again with the addition of maple extract, as written, but even without it, so far it's Maple Cupcakes for the win. Somewhere, I have a recipe for a pretty good chocolate chip pumpkin muffin. 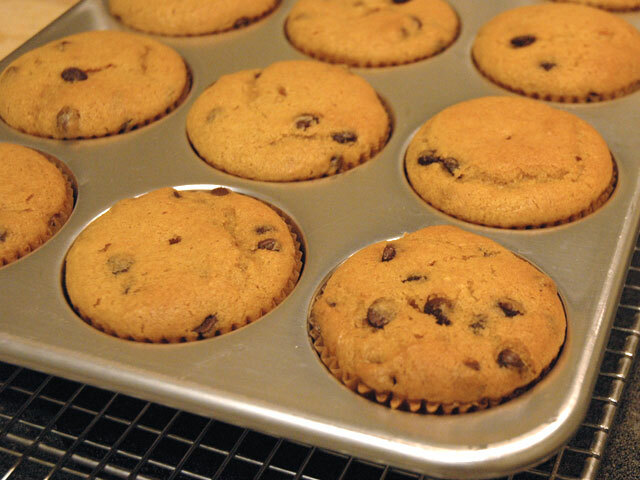 It's a little tough, & a little too sweet, but not bad for a vegan muffin. I thought I would bake a batch for Thanksgiving, but because my recipe-filling system is "shove everything in an expanding file & sort it out later," I couldn't find it. 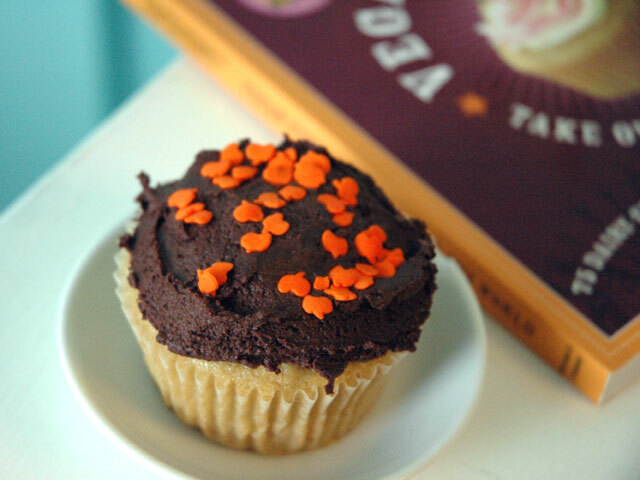 So, of course, I turned to VCTotW, p. 126: Pumpkin Chocolate Chip Cupcakes with Cinnamon Icing. Anyway, the cupcakes were a cinch to mix up, & they turned out beautifully. I was going to give the Cinnamon Icing a miss, but then decided to make leaves with it (although certain small girly factions of the family insist that they're butterflies. I even broke out the flash so you could very clearly see that they are leaves). If you make these, I definitely recommend the icing; I'm not sure I'd want gobs of it, but just a little bit piped on adds a nice spicy touch. The verdict: thumbs up on flavor (oh, speaking of which, I used fresh roasted pumpkin for these because I had some around, & I think they might actually have done better with the denser, less watery flavor of canned), thumbs held out sort of sideways on texture (although, see previous "watery" comment re: texture being a little too moist. They might be better all around with canned pumpkin). The second cupcake from my Vegan Cupcakes Take Over the World project: Your Basic Chocolate Cupcake, p. 37. I really did mean to frost these with the Fluffy Buttercream Frosting, but I decided that I should probably eat a plain one for review purposes, & then I was really busy trying to get out of town for the weekend (this was last weekend, when I had all those fun Portland plans), so I just threw the lid on the cupcake pan & hit the road. Judging from the way they disappeared down at my parents' house, the lack of frosting wasn't a problem. Great flavor on these, even better the next day. I used 1/2 tsp. almond extract in the "optional other flavor or just add more vanilla" part, & I really liked the flavor, although I think I might try to track down some chocolate extract so I can try that variation (I'm also very interested in the chocolate-orange option listed at the end of the recipe). The texture was a little less excitingly cakey than the Golden Vanilla Cupcakes, but in the end I decided that they weren't so much squidgey as they were very light. Taste outweighs texture on these, though, & I'll definitely be making them again soon (where "soon" very probably means "later this afternoon, this time with frosting."). vegan cupcakes, take over my world! I'm a longtime vegetarian who married into food allergies, & without being too boring about it, the end result is that the majority of my cooking & just about all of my baking is vegan. As my formal title is longtime vegetarian with ferocious sweet tooth, imagine my delight when Vegan Cupcakes Take Over the World finally hit the shelves. Great title, beautiful book, plus, cupcakes. I have baked many a vegan cake over the past decade, & even my best efforts often have a slightly gummy texture (referred to around here as "the squidge") & too-sweet edge (this is particularly a problem with vanilla-type cake). Don't get me wrong, there are some recipes out there that I think are truly fantastic (the carrot cake recipe from Real Food Daily being one, & also I have this really great gingersnap recipe), but I often just get a box of mini vegan cupcakes from PCC & call it a day. But this, this is exciting. 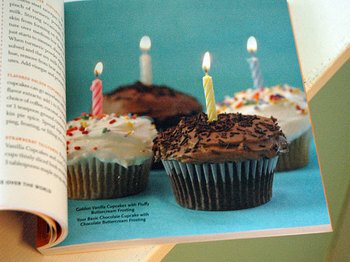 I think I'm going to bake every cupcake in this book. Well, maybe not the gluten-free ones. And I'm not that interested in the low-fat ones, either. But I think I'm going to bake all the rest. Seriously, this book is beautiful. That's the glamour version of my inaugural cupcake (Cupcake 01), Golden Vanilla Cupcakes with Chocolate Buttercream Frosting (I wanted to do white cake/white frosting first, because that's a hard one to pull off well veganstyle & therefore a great test of this book's cupcake superpowers. Instead, I let the kids choose). My version is somewhat less gorgeous (seasonal style points for the little pumpkins, though, yes?). I'm not sure if it's because I made the frosting & then kept it in the fridge overnight before using it, or if it's because I just didn't spend enough time fluffing it up, but it stayed much darker & denser than the book picture shows. 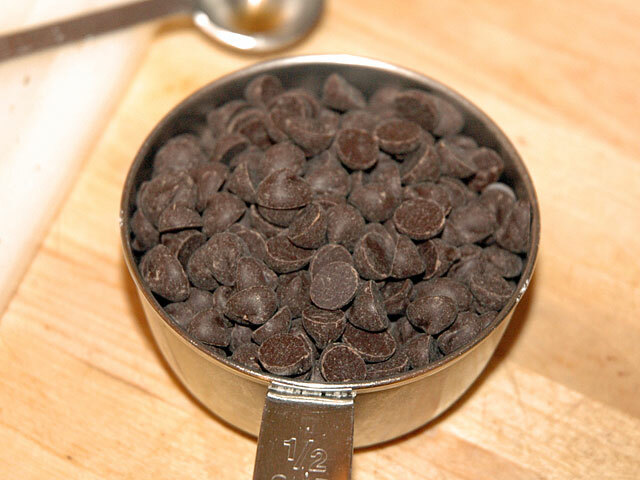 Happily, "darker" & "denser" is not generally a problem when we're talking about chocolate, & I have zero flavor complaints. The missing picture here is the one where the cupcakes came out of the oven perfectly domed, but you can see how nicely structural they are here (this is a big deal in vegan baking, I promise). The crumb is less fine than you'd find in a conventional cupcake, but I really mean "fine" only in the coarse/fine sense, since the texture is very cakey &, most importantly, squidge-free. The taste is easily as good as the vanilla cupcakes I get from the store*, so while this batch didn't rock my socks off (see: regular consumption of similar cupcakes), it's not that it couldn't have, it's just that I'm jaded. 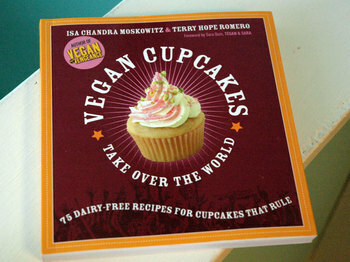 I think these might be the best vanilla vegan cupcakes I've ever made, & I have high hopes for the rest of the book. Up next: chocolate with vanilla frosting (note clever reversal). *To be fair: if you're looking for a fool-the-omnivore cupcake, I don't think this is it, but these are great in their own right.